"100 YEARS OF JAZZ IN 99 MINUTES." There’s a certain breathless quality to that heading, isn’t there? Can it be possible to cover a century’s-worth of jazz history with a single group of musicians on one stage in less time than it takes an episode of ‘Midsomer Murders’ to amble across your TV screens? Well, yes, would be my answer, having already witnessed this sure-fire ensemble and their varied machinations several times. Drummer and some-time sousaphone player and bassist Richard Pite is chief cheer-leader and instigator and he points me to his Jazz Repertory Company and their raison d’etre – ‘Authentic Live Recreations of the Greatest Music in Jazz History – Performed by the UK’s Finest Musicians’ – no mean claim but one that has already been substantiated by any number of their focussed concert presentations. Which brings us to ‘100 Years of Jazz’ originally conceived as an extension to pianist Keith Nichols’ show called ‘Jazz Classics Revisited’ first performed in 1989 with which Richard Pite has always been associated. “Many years later,” he says, “I thought I’d have a go and try to continue with the idea up to the present day. Anyone who has seen Keith perform will know that he has a very winning combination of erudition and humour in his presentation. I wanted 100 Years to do the same.” And hey presto, here we have it. “Six musicians zip through a century of jazz. It would be easy to just do little snippets to cram in as much as possible but we do let the musicians stretch out on a few numbers. Audiences seem to like it very much,” he adds. I can certainly vouch for that, for since it debuted at Cadogan Hall in 2013, Pite has taken the show here, there and everywhere, audience responses verging on the ecstatic. It’s the sheer zest of the performances, their pace and virtuosity, and that leavening of humour that appeals, as Pite explains, "What’s special is no-one gets away with doing just one thing – they all multi-task. They play different styles from different eras with authenticity [more difficult than it sounds] and they all talk to the audience at various points in the show.” So, who are these supermen and superwomen of jazz? “Pete Long plays a variety of saxophones plus flute, trumpet and bass guitar, Enrico Tomasso plays trumpet, trombone and sings; Georgina Jackson plays trumpet and sings; Nick Dawson plays piano, synth, clarinet and sings; Dave Chamberlain plays double bass, electric bass and a variety of guitars, banjo, piano and drums,” all ably backed and supported by Pite himself, of course. Pite’s jazz evangelism took wing in the late 1990s when he formed the JRC to promote the many Nichols formats; it was only in 2008 that he began to stage his own shows. The first was ‘Artie Shaw With Strings’, which was musically successful but bombed at the box-office. Undaunted, Pite and his wife Joy pursued the dream and created a series of themed presentations, all ambitious in their reach but cleverly achieved, many premiered at Cadogan Hall, among them a replication of the Benny Goodman Orchestra’s celebrated 1938 Carnegie Hall Concert, an evocation of 1920s Paul Whiteman and Rhapsody In Blue, a Tribute to Jazz At The Philharmonic, and a recreation of the Newport Jazz Festivals of the 1950s. Is there more to come? 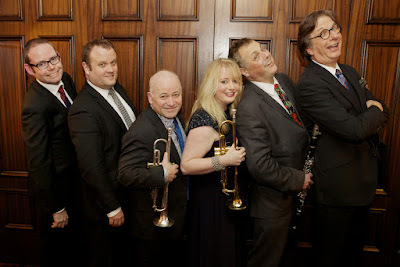 “There’s a follow-up JRC show,” he tells me, “imaginatively titled ‘Another 100 Years of Jazz’ due at Cadogan Hall on September 24 but before then, we return to the music of Goodman and Glenn Miller from their 1939 heyday again at the Hall on June 18.” Good news all round, I’d say.